The ezPatch 100A is a smart manipulator. It has all the functions a manual manipulator has. In addition, it comes with a computer controlled feedback system so that it can stop precisely after electrode touches cell membrane. The system is ideal for patch clamp. In patch clamp experiments, all users need to do is aim the electrode at a selected cell. A click of a button and the electrode will stop at the surface of the cell membrane in specified speed and pressure (measured by resistance increase). Patch clamp experiments will be consistent and precise once you find the best seal parameters. The seal parameters can be saved for different cell types and shared among lab members. The control software has many functions that make patch clamp experiments easy and precise. You can excise patches at the predefined speed. With the manual control functions in the software, you may move the electrode forward or backward as small as 0.1 µm in defined speed. The software can also control multiple manipulators. 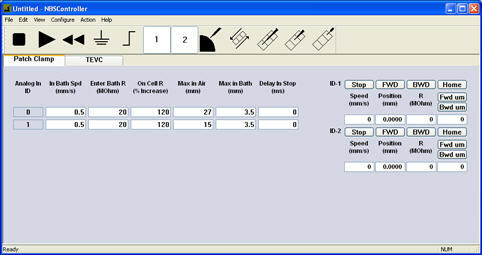 Therefore users can make seals on the same cell or a few different cells simultaneously. If drift from pipette holder/o-ring is a concern, an optional pipette holder clamp can be purchased. It clamps the glass pipette so that the drift caused by o-ring is minimal. There is no additional electrical noise from the manipulator since no current is going through the motor when it stops. 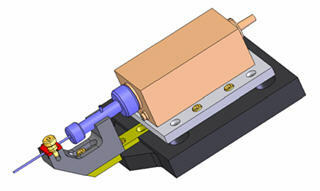 The friction can ensure that the motor does not loose even a micro step gear (50 nm). The BNC interface box comes with 10 Analog INs and 2 Analog OUTs. A trigger is provided for sync in case needed. For the best grounding result, software can control the BNC interface box to be either in float or grounded condition. The ezPATCH 100A comes with National Instruments’ PCI 6221 DAQ board which is supported by many data acquisition software such as jCLAMP. If you plan to choose the software you will not need to purchase extra data acquisition board. Includes a computer controlled manipulator, a data acquisition board, a BNC interface box, and a control software. 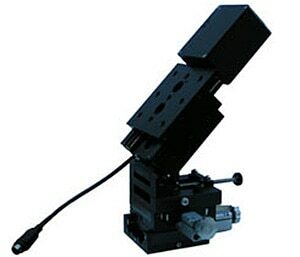 Resolution of the computer controlled manipulator is 50 nm. Manipulator movement stops when patch pipette touches cell membrane. No electrical noise during recording.